Home » Baptism » Why Do Catholics Baptize Babies? “go therefore and make disciples of all nations, baptizing them in the name of the Father and of the Son and of the Holy Spirit, teaching them to observe all that I have commanded you.” (Matthew 28:19). “Go into all the world and preach the Good News to everyone, everywhere. Anyone who believes and is baptized will be saved. But anyone who refuses to believe will be condemned. (Mark 16:15-16). Baptism is the pivotal first step we take in becoming initiated members of the Church. Along with communion and confirmation, baptism makes up the three sacraments of initiation. The Sacrament of Baptism is steeped in history, dating back to the time of Jesus, when He was baptized by John the Baptist. This richly symbolic sacrament is one of the most important sacraments because without first receiving it, we cannot receive any of the six other sacraments. What is the message of this gateway sacrament? 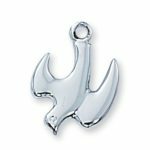 What are the symbols associated with baptism? The word baptism comes from the Greek word, baptizein, which means “to plunge” or “immerse.” The water that’s poured onto our heads at baptism symbolizes the washing away of original sin. The act not only symbolizes our purification, but it also marks our rebirth or renewal. In the words of Pope Francis, baptism “gives us new birth in Christ, makes us sharers in the mystery of his death and resurrection, grants the forgiveness of sin and brings us new freedom as God’s children and members of his Church.” In a nutshell: baptism gives us salvation, granting us eternal life with God. transmit our faith from generation to generation. While the Sacraments of Communion and Confirmation are administered to children and young adults when they reach the age of reason, baptism is typically administered to infants. The purpose is to cleanse babies of original sin at the earliest age possible, so they can become children of God, members of His Body, and the Church. Since babies cannot speak for themselves, their parents and godparents play a vital role in their baptism. It’s the role of parents and godparents to help the newly baptized grow in faith by teaching them the Scriptures and leading by example. 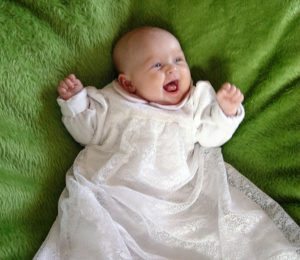 Why Do Babies Wear White Gowns? The dove—white and graceful—is the symbol of the Holy Spirit. During the baptismal ceremony, the newly baptized are anointed with sacred oil to signify that the Holy Spirit dwells within their hearts. The Holy Spirit, in the form of a dove, appeared to Jesus after He was baptized in the Jordan River. According to Matthew 3:16: “When Jesus had been baptized, he immediately came up out of the water. Suddenly, the heavens opened up for him, and he saw the Spirit of God descending like a dove and coming to rest on him.” For all those who are baptized, the Spirit comes down and remains in their purified hearts. 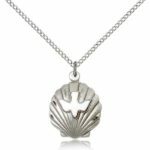 The shell, especially the scallop shell, is another symbol associated with baptism. Historians refer to the shell as the symbol of pilgrimage. It’s also often associated with St. John the Baptist and his role in baptizing Christ. Most paintings of John the Baptist depict him holding a shell in his hand, with water pouring from it, in reference to when he baptized Jesus in the Jordan River. The symbol of a shell is often found on baptismal fonts, and many priests use a receptacle in the shape of a shell to pour the baptismal water onto the heads of infants.